Holiday season is over. Gifts were exchanged, miles were traveled, resolutions were made, and much alcohol was consumed. Time to get back to work, renewed and energized for the new year. While we had our share of merry-making here at JFrog, we also managed to get some work done between the revelry, and released Artifactory 4.4. With Refrigerators ordering groceries, bracelets tracking your physical activity, and even smart bras to prevent emotional overeating, the IoT is going exponential. As the vast diversity of connected devices continues to grow, we understand that binary components developed for these devices need to be managed just like any other enterprise software. So, in Artifactory 4.4, we added Opkg to the already impressive array of package formats that Artifactory supports. This means that you can use the Opkg client to work with local and remote Opkg repositories, transparently, through Artifactory. Distribute and share your local Opkg packages through local repositories, complete with support for GPG signing keys (care of Artifactory’s Debian signing keys). For external components, Artifactory proxies and caches remote Opkg resources like downloads.openwrt.com in remote repositories. You can even use Artifactory’s smart search to locate all your Opkg packages. Development for embedded devices just took a giant leap into 2016 with Artifactory’s support for Opkg. Artifactory 4.4 introduces some major improvements in security that give you SSH integration, login protection, and OAuth support for Docker client. Artifactory 4.4 introduces SSH integration allowing client apps to connect to Artifactory securely. So next time you Instead of logging in with your Artifactory user and password, you can just configure Artifactory with your public key and never have to expose your login credentials again. Currently, Artifactory supports the Git LFS client and Artifactory CLI, and you can expect support for more clients to be added in future releases. Did you know that identity theft is on the rise, both in the US and in Europe? While you might normally associate identity theft with someone stealing your credit card, in our world, it means gaining unauthorized access to your Artifactory account. A common way to do this is by making repeated attempts to log in while trying to guess your credentials. Artifactory now combats these brute force attacks with temporary login suspension that eventually leads to locking a user out altogether. It works like this. If attempting to log into Artifactory using wrong credentials, Artifactory implements a login suspension protocol that is very effective against bots that hammer away trying different passwords, and makes it very unlikely for them to succeed before the next ice-age. What’s more, you can even configure Artifactory to lock the account altogether after a fixed number of failed login attempts. Only an Artifactory administrator can release a locked user account. The title says it all. 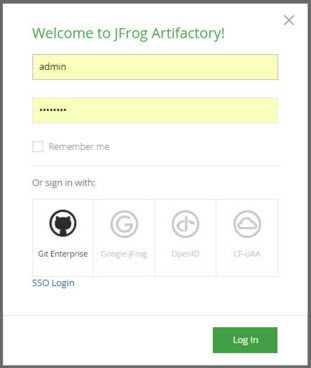 Login to Artifactory with OAuth using your GitHub Enterprise credentials, and docker login will work using the OAuth token without needing any additional credentials. A.k.a. the Artifactory Trash Can. Remember last time you said “Oops!” (or something worse) when you accidentally deleted an important binary? Well, Artifactory is now your cure for Deletion Blues. 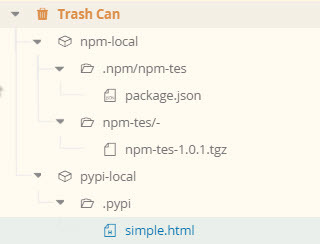 The trash can behaves just like the common recycle bin we are all familiar with on many file systems, and holds on to your deleted items for the configured period of time before permanently removing them. During that time you can recover any deleted items, or empty the trash can if you run into a storage crunch. Those are the main updates, but there is, of course, more. From extracting RubyGems licenses and Docker labels and displaying them as properties to inserting your own user credentials into the Set Me Up dialogs and many other goodies. We’ve already had two more minor releases since 4.4, but you won’t enjoy all the updates unless you download the latest Artifactory.